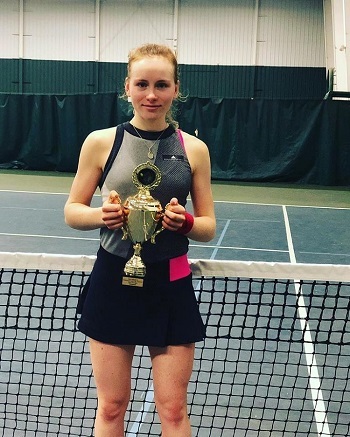 Sonia Tartakovsky was around the age of six when, on vacation with her family, she was introduced to the sport of tennis for the first time. “When we came back home from that trip, I was like, ‘Mom, I want to play tennis,’” Tartakovsky recalls. Tartakovsky began taking tennis lessons, but was still juggling other sports, included swimming, a sport where she qualified for the Junior Olympics. But there came a time when she needed to commit herself fully to one sport, and she chose tennis. “I thought it was more fun. It’s not swimming laps back and forth, so I enjoyed it more,” Tartakovsky said. As she got older, she began to take more lessons and started competing in tournaments. At one of those tournaments (in Canada), she saw a few kids wearing CourtSense shirts and liked the way they played. From then, she knew where she wanted to further her training. Sonia has been with CourtSense at Bogota Racquet Club for just about four years now, and has become one of the program’s top players. Tartakovsky has worked primarily with Asher Salam, a High Performance Coach at Bogota Racquet Club, for the last year and a half. Tartakovsky’s game was very raw when she first began training with Salam, not necessarily from a technical standpoint, but she needed to change her approach. In addition, Tartakovsky has taken advantage of the amenities that the CourtSense program offers, which includes a sport scientist, as well as PlaySight technology on its courts. The combination of all those factors has molded Tartakovsky into the player she is today, and set the foundation for even more growth. "Sonia has a professional player’s outlook when it comes to improving her tennis performance, realizing that her ability to perform is only as good as her ability to recover,” said Adamek. “Her work effort and knowledge to continuously evaluate, and train, the underlying physical: balance, timing, coordination, endurance, and cognitive: brain speed, decision-making, emotional control, components of performance has led to her becoming a complete package and is a major factor leading to her rise up the junior ranks." A five-star recruit, according to TennisRecruiting.net, the junior has verbally committed to the University of Pennsylvania. She first met the Head Coach, Sanela Kunovac, after Ognen Nikolovski, Director of Tennis at CourtSense’s Bogota Racquet Club, asked her to come down to watch Tartakovsky play. Kunovac liked what she saw, and asked Tartakovsky to take an unofficial visit to Penn’s campus. Tartakovsky is currently completing her high school education online at Stanford Online High School. Being able to attend her classes online is extremely important with her tournament schedule, and attending Stanford Online allows her to compete in some of the top National tournaments. One of those tournaments came at the end of last year, when she finished as a finalist at the Super Nationals in Weymouth, Mass., a success she looks to build on throughout this year. Her passion for the game and the determination to improve are some of the attributes that makes her stand out, and that mindset comes from within. 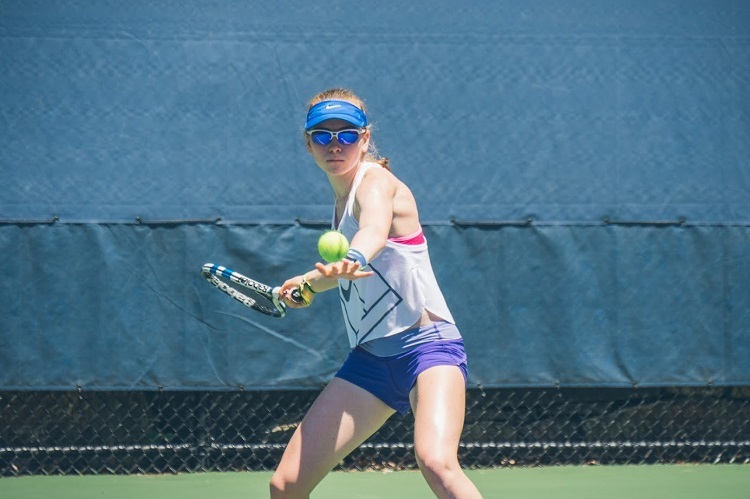 That sort of internal drive is what has allowed Tartakovsky to become a top-ranked national player, and will play a major role in her continued tennis development as she prepares for her college career.